I really love trains, but I really hate enclosed spaces. So when Antony suggested we spend 48 hours of our honeymoon travelling from one side of America to the other on a train, including sleeping on it, I was understandably conflicted. The AMTRAK-operated Sunset Limited is hardly the longest train journey in the world, but it covers a lot of ground. It used to cover even more: 2,746 miles (4,472km) to be precise. It was the only way to travel from the East Coast of the United States to the West on a single train. That was until Hurricane Katrina swept away part of the stretch running from Orlando to New Orleans. Now there is no way to cross coast to coast without changing trains. The Sunset Limited, is the closest you will get. It currently runs at 1,995 miles. That's still a decent chunk of train time. We joined the Sunset Limited at the New Orleans end. After 48 somewhat manic hours in the "Big Easy" I was secretly looking forward to taking it very easy for a while. A lengthy sit down was just what I needed. However, what I wasn't looking forward to was seeing our roomette for the first time. When we booked, there were no rooms (without the scary diminutive '-ette' suffix) available. We'd read that some passengers spent the entire 48 hours without a bed, preferring to sleep in the large (allegedly comfortable) chairs. As an incredibly fussy sleeper, this sounded like hell to me. 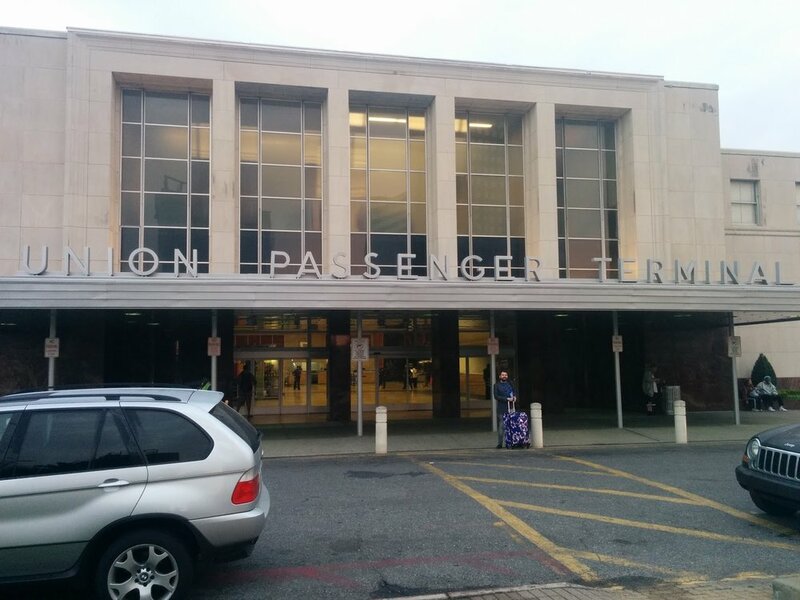 So I had to choose: sit in a chair wide awake for 48 hours or book the roomette and run the risk of having a full-on claustrophobic panic attack before we'd even left Louisiana. To my colossal relief, the roomette was roomier than I had envisioned. In the day, it gave us enough space for us to sit comfortably opposite each other. At night, it converted into a bunk bed with more than enough room for two men, both around six feet tall to get some surprisingly good sleep. Only a few weeks ago, I read a study that explained why rocking babies helps to send them off to sleep. The first night on the Sunset Limited, I discovered it's the same for me on a train. The two nights we spent in our roomette were were some of the best nights' sleep I've ever had. Usually, any repetitive noise keeps we staring up at the ceiling until the early hours, but the gentle click-clack as the wheels moved over the small joins sent me right off. If I did wake up, it was only very briefly, and then either because I needed the loo (just down the end of the sleeping car) or because I was so excited about travelling through a particular place. At home or abroad, I rarely need an alarm clock. My brain wakes me up when I tell it to. It did a good job of waking me up at the places I wanted to see. In the morning I found several poorly lit photos on my phone which must have seemed a worthwhile undertaking at 3am or whatever before I slipped back into unconsciousness each time. A roomette is more spacious than that worrying diminutive suffix (and this photo) would have you believe. Note the look of pure relief on my face. Yuma, Arizona, at some point in the middle of the night. At least, I think it's Yuma. I was tired and the train was soooo good at rocking me back to sleep. The nights are special but the days are when the Sunset Limited really comes into its own. Once out of Louisiana, you get to experience Texas. And then more Texas. And then a lot more Texas. The onboard announcer, who was hilarious throughout, delighted in counting down the 24 hours spent traversing the 'Lone Star' state. Fortunately, the Sunset Limited comes equipped with a dedicated Sightseer Lounge Car. Almost floor to ceiling glass panels provide the widescreen panoramas you're looking for. Just minutes after pulling out of New Orleans station the Sunset Limited crosses the Huey P Long Bridge and heads into bayou country. In the Sightseer Lounge Car you don't miss a thing. The next state after Louisiana is Texas. We went to sleep looking out at Texas and we woke up... looking out at Texas. The Sunset Limited doesn't stop for long in most of the stations. This is very much a tour from the comfort of your immaculately upholstered, air conditioned sightseeing carriage. Every so often you can jump off for ten minutes to take a quick selfie or pose with some cowboy statues (a must for everyone surely?). Had to be done. It's the law 'round these parts pardner. Trainspotter's notepad just out of shot. One of the places where we knew we'd have a bit more time was El Paso. 30 minutes to be precise. It's the last station before crossing the Rio Grande and finally leaving Texas. El Paso is the place where the first Margarita was mixed in 1945. Knowing this (we're both huge fans of the beverage), we made it our mission to find a bar near to the station that served them in the traditional manner (salt rim mandatory), drink a pair and somehow get back to the train before it left us stranded on the US-Mexico border. This was easier than it sounded, especially as it was not even lunchtime. Would we even find somewhere serving at that time? And a well made Margarita isn't the fastest drink to make - would we made it back in time? Fortunately, we were lucky to stumble down the right side street, find a bar that was open and a bartender who was accommodating to our "we need to have downed these and be out of here in ten minutes" needs. We may look relaxed in this photo (taken by our bemused bartender) but actually we're thinking the train really will leave us stranded in El Paso if we're not back on it in seven minutes and it's a six minute jog back to the station from here. Fortified by tequila, orange liquer and lime juice, I get cocky and risk having my photo taken before time really does run out (actually, the train was right behind us). 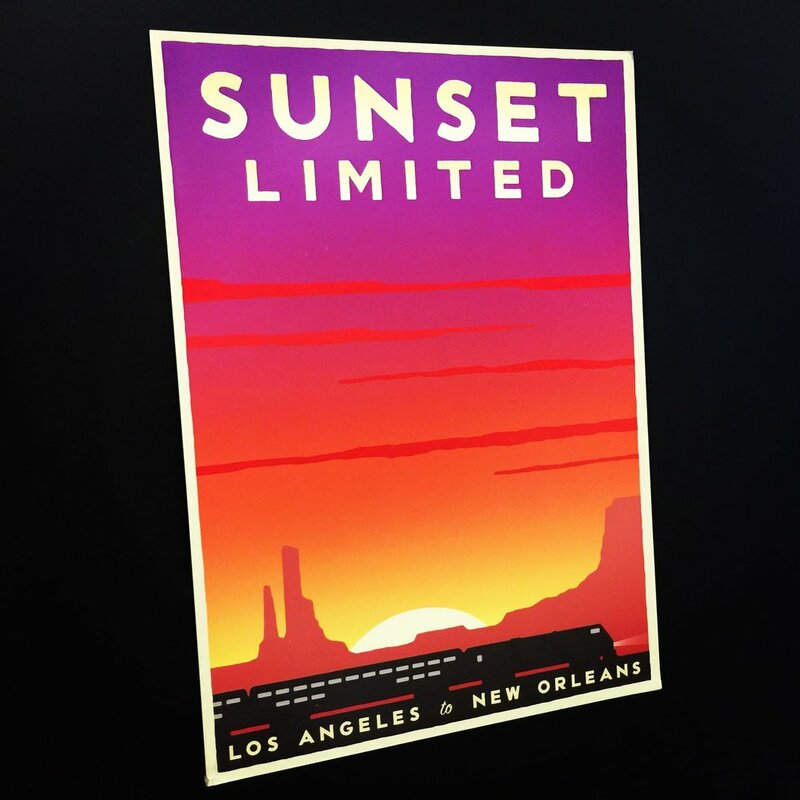 This adrenaline-pumping experience aside, most of our Sunset Limited experience was a thoroughly relaxing experience. The food was excellent and we both gained a couple of pounds in those 48 hours. The onboard drink selection was on par with what you would find on a Virgin Train in the UK (I.E. don't expect a mixologist but if you know what you're doing that shouldn't hold you back). Who needs a cocktail menu when they sell the ingredients for you to make your own? New Mexico and Arizona pass surprisingly swiftly in comparison with the gargantuan Texas. Which isn't to say there isn't a lot to see. The announcer keeps passengers informed throughout, pointing out historical connections of many of the smaller towns and villages. Nevertheless, I'd strongly recommend tracking down a copy of USA by Rail by John Pitt (Bradt, 2012). It's in need of an update, but most of the interesting trackside curios it reveals have been around for over a hundred years and aren't going anywhere soon. We were both sad when our (almost) coast-to-coast experience was coming to an end. Los Angeles, our final destination, beckoned. Except this wasn't the final destination for us, but merely a way-point: we had a connecting flight to San Francisco for the next leg of our honeymoon. Trapped in our glass Sightseer Lounge bubble and surprisingly-spacious roomette, we lost all track of time. It therefore came as a surprise to realise that because we'd been stuck behind a freight train as we crossed into California (something no one associated with the Sunset Limited could have avoided), this had slowed us down enough for the train to arrive a couple of hours late - and miss our connecting flight to San Francisco. On the plus side, getting a plane from Los Angeles to San Francisco is just like getting a posh taxi, and won't burn a hole in anyone's pocket. It was a small, not unreasonably priced inconvenience that did not taint the priceless memories of our first overnight train journey. Based on this experience, it definitely won't be our last.